Available in 15", 15.6", 19"
The PAB1080PX Series is an all-in-one network digital signage display (various sizes 15"/ 15.6"/ 19"/ 22" available for selection) that plays media files on memory card without a computer, and the latest contents can be updated automatically via an IP network. The remote management software (POP Center) enables you to manage the PAB1080PX Series deployments anywhere in the world. The POP Center provides you complete control to upload contents, schedule playlists, set multi-display modes and monitor the real-time status of each unit. 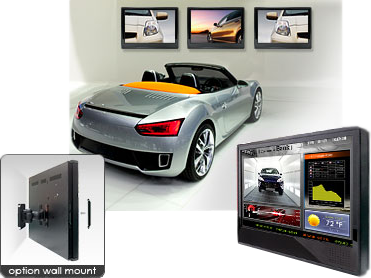 The PAB1080PX Series are ideal for advertising, retail displays, digital poster, museum exhibits and other applications. Schedule Function (model 2/ 3/ 4/ 5): Automatically play the specific file at the specific date. 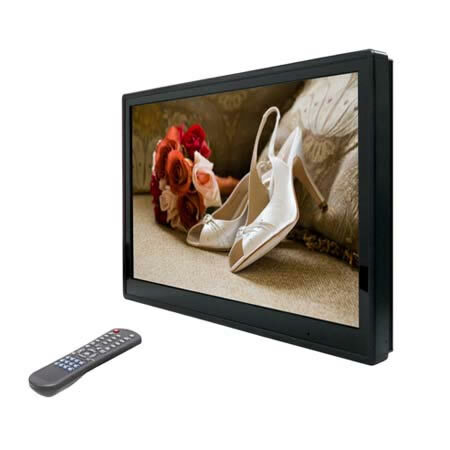 Multi-Zone Display (model 3/ 4/ 5): Displays the movie, picture (supports png format/ size: 213x641/ 96DPI) and scrolling text on the screen simultaneously. Mode 1: Display video files with scrolling text. Mode 2: Display video files, pictures and scrolling text simultaneously. The pictures can be repositioned to left or right of the videos. The display speed of the scrolling text can be adjusted, and scrolling text supports multi languages. 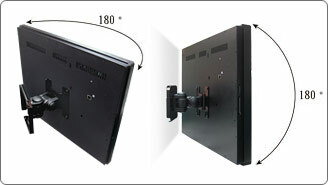 HDMI Input (model 4): Supports HDMI input to display videos from HDMI sources (such as HDMI DVD player or HDMI Game Box). Video Input (model 5): Supports video input to display live videos from TV box, DVD player or camera. Includes a full-function infrared remote control. Connect using an Ethernet network cable at up to 100Mbps. Supports CF and SD(HC) memory cards. Supports Auto Key Lock Function. Exports the Configuration Values: You can export the configuration value to the CF card and the configuration value can be modified on your PC. Supports FTP Auto Download Function: Connect to Remote FTP server and download data to the CF card automatically. Supports Download Pause / Resume Function: Continue unfinished downloads upon next session. Supports NTP Network (G.M.T) Timer. Supports Universal Plug and Play (UPnP) and DHCP. Support VESA 100 (100mm x 100mm). Bundle Remote Management Software (POP Center). Standard Version (free): Manage 5 x B1080PX. Professional Version: Manage up to 100 x B1080PX. Automatically search the connected B1080PX without any complicated setup. Schedule playlists at different times of the day or days of the week. Monitor status and log files of each B1080PX. 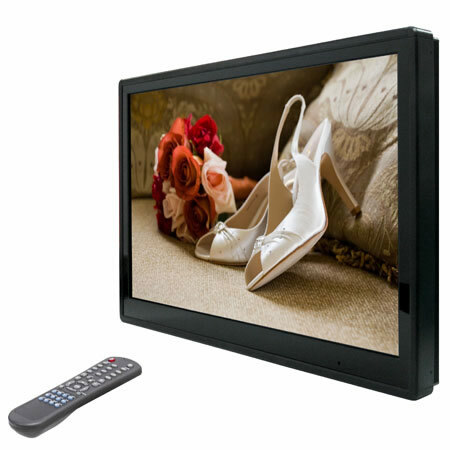 Holds 10" to 22" LCD monitor up to 15 kg. Three adjustable joints: Horizontal 180 degrees/ Vertical 180 degrees/ Swivels 360 degrees. Press one of the wireless touch-sensor buttons, the PA15B1080PX/ PA156B1080PX/ PA19B1080PX/ PA22B1080PX will play the corresponding file automatically. The number of touch-sensor buttons can be customized to 12, 24 or 36 for OEM project. Used with various operating environment (glass, plastics and acrylic material, except metal material), the thickness supports 3mm - 5mm, and it can be customized to 5cm for OEM project. Press one of the play buttons to play the corresponding file. Supports up to 12 play buttons. The PA15B1080PX/ PA156B1080PX/ PA19B1080PX/ PA22B1080PX will auto play the specific file at the specific date.